I received an email from a friend who offered her garden to me to come and get some cuttings. With its mixture of exotics and Australian native plants this is the equivalent of offering me a block of chocolate 😀 . Why take cuttings? 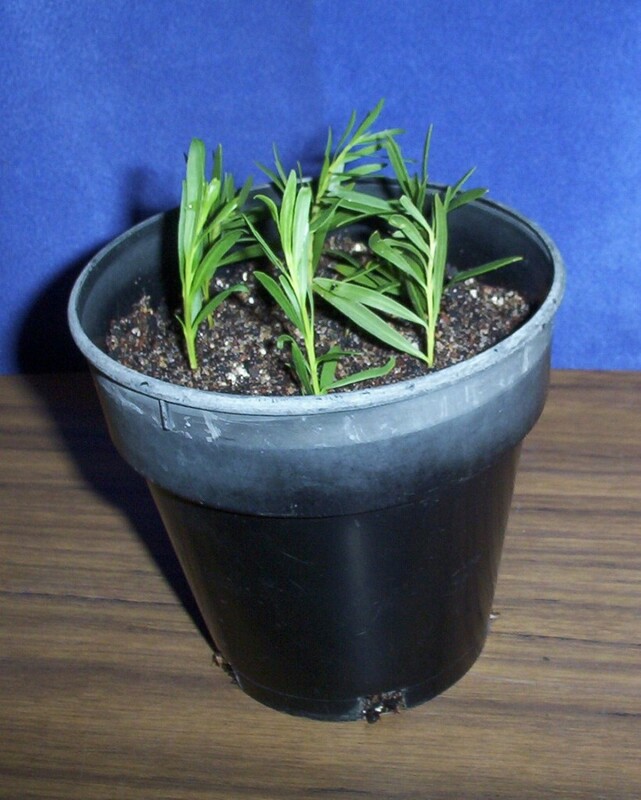 Plants like Eremophilas (Emu Bushes) are difficult to raise from seed. If a particular flower colour or plant habit is required, taking cuttings from the plant with these desirable qualities guarantees that the new plant will have the characteristics that are wanted. This is a great time of the year in South Australia to begin setting cuttings as the warmth stimulates root growth quickly because many plants are in growth mode. This is basically how I do it. 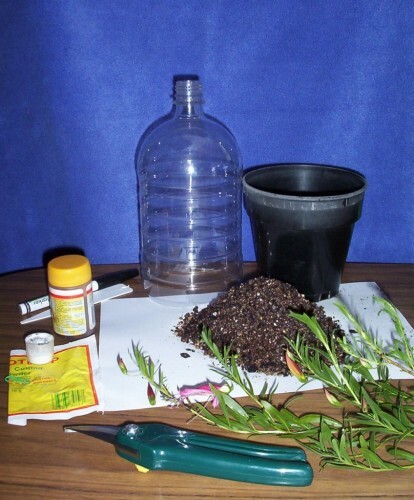 Collect together a suitable clean pot (140-150mm across) with good drainage holes, some freely draining propagating mix, sharp secateurs or snips, some sort of plant hormone powder or gel (from garden centres) if needed, a label and suitable pen, a plastic bag or plastic drink bottle with the bottom removed. Fill the pot with the mix within 2-3 cm of the top and firm down gently. Collect the cutting material. 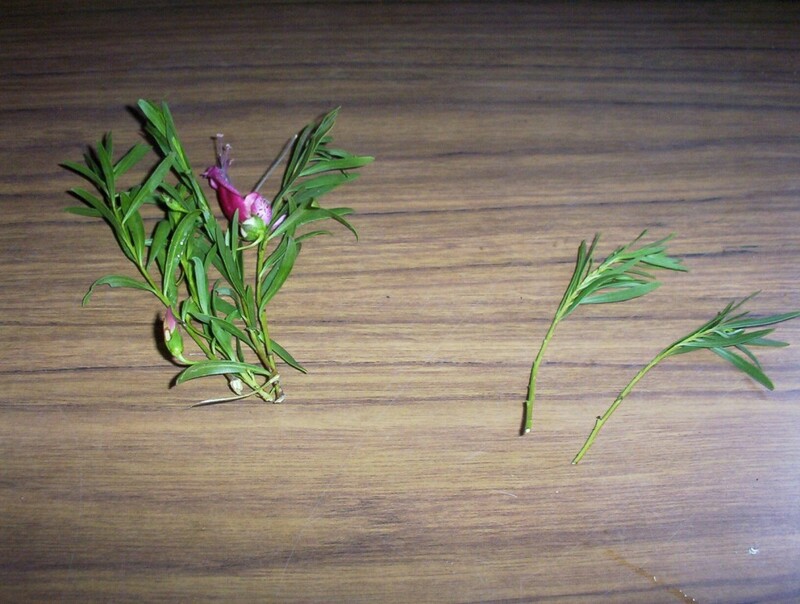 (I used Eremophila maculata from the bush in the previous post.) Trim it to length (about 10cm long) making a cut immediately below a point where a leaf joins the stem. This point is called a leaf node. 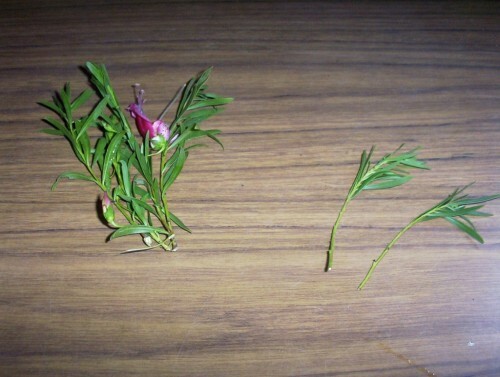 Remove the lower leaves on the stem, cut any large leaves in half. Always keep moist by standing in water or keeping it covered with plastic or moist paper. Dip the end of the cutting in the plant rooting hormone if using it. (Follow directions on the container.) Roots will grow from this point and sometimes along the lower part of the stem. Make a hole 2-3cm deep in the mix with a piece of dowel or knitting needle equivalent and insert the cutting. Firm the mix around the stem. Several cuttings can be placed in the one pot, suitably spaced so that the leaves do not touch one another. Water gently to settle the mix around the stems. Place the drink bottle over the top of the cuttings or the pot depending on size, write the name of the plant on the label, where the piece came from and the date and put the lot in a warm spot out of direct sunlight. The mix needs to be kept moist not soggy, so watering may be necessary only once a week depending on the ingredients in the propagating mix. The cover retains humidity around the leaves of the plant pieces. Small heated propagators can be purchased which make the rooting process occur quicker. A hot house, which I use, is ideal. 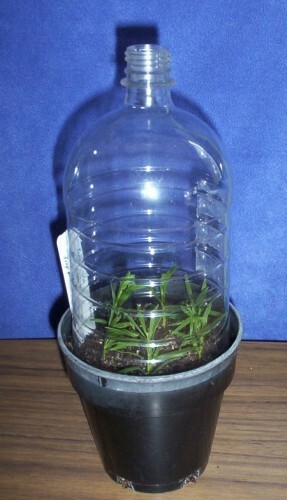 In this case the extra cover over the cuttings is unnecessary. The idea is to keep the leaves cooler than the mix in the pot. Slight moisture on the leaves achieves this cooling effect much like perspiration does in humans. Roots should appear in 3-6 weeks depending on the weather and the type of plant. Some Australian native plants are notoriously difficult to strike but I never give up entirely. One never knows when success will come. More details on the above points in the next couple of posts. Found this post via Darren’s feed. Great to see you putting it out there Corinne and a great how-to article. Nice “How-to” posting,we use a similiar process for our Southern California garden. It keeps the cost down of buying new plant and also a great sense of achievement. Nice post, I like the pictures with it. I’m not very good with plants or fish. I hopped over from problogger. Great How to! My parents owned a flower shop for 18 years. You said it well! Thanks for contributing to the group writing project. My How To is up also. Ah, that’s how I used to do it – makes me miss my garden! Our how-to is up as well if you’d like to check it out!! This is one of my favourites in the whole project! Brilliant post – a truly useful how-to! Very nice post. I always wondered what “taking cuttings” meant. When someone shows you as clearly as this it makes sense, even to someone like me who is gardening-challenged! Good post. I’ve raised quite a few eremophilas from cuttings. however I do not place a cover over the cuttings. basically I water my cuttings from the bottom with water up to 1/2 inch deep all the time and keep the top dry. this prevents the leaves from rotting and or fungus. I used to cover earlier but found that often they developed fungus etc. then discussing this with a successful grower who advised me to keep the top etc dry. Some eremophilas can take 6-9 months to strike so be patient. none that I’ve grown minde being wet at the bottom.